MSA compressed airline breathing apparatus function independent from the ambient atmosphere. They can be used in all places where the ambient air is not breathable because of contaminants or oxygen deficiency and where filtering devices do not provide sufficient protection. With the lightweight design and the unlimited time of compressed air supply from a compressed air line system, resp. a compressor, or a limited time of compressed air supply from a cascade cylinder, they are used for a multitude of applications in industry and mining. 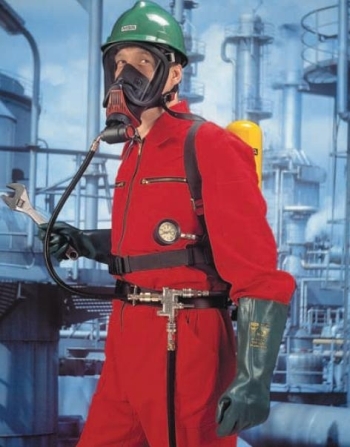 The MSA compressed airline breathing apparatus consists of a facepiece that is connected to a compressed air supply by a compressed airline. The facepiece can be a hood or a full face mask with a lung governed demand valve. The lung governed demand valves supply only so much air as is required during inhalation. Thus, the air consumption is economical which makes it especially suitable for cascade cylinders. The connection between the lung governed demand valve and the air source is a connector or change-over valve [emergency air supply] that is fixed to the waist belt. This prevents tensile force being transmitted to the facepiece. With hoods the air flow is regulated with a pressure control. This permits individual adjustment of the constant air flow from the air source to the hood as required. By fixing the control to the waist belt, this prevents tensile force being transmitted to the facepiece.